Photographer Maurizio Picci tells us about the importance of pre-photographic procedures. I often find myself taking pictures of the most diverse things, both for personal passion and work reasons. In all cases, the pre-photography rite is important: to take the perfect picture, you need TO OBSERVE. 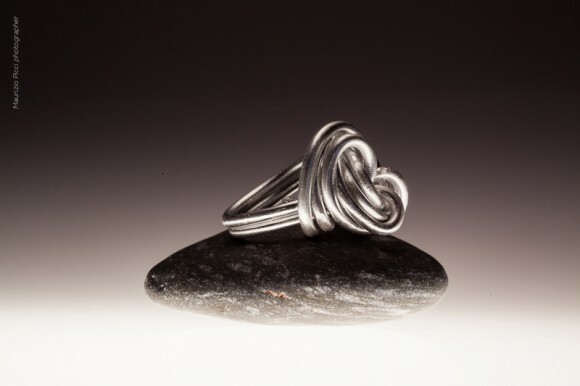 The jewel I chose as an example is an aluminum ring crafted by Monica Bardino for Persea Design. The metal feels smooth; it is nice and supple to the touch. The first thing that came into my mind was to play with contrasts. 2 mm white plexiglass (I bought a 1mX1m sheet for 17.90€ , but a white cardboard will be fine too). a 60 W spot-light lamp(2,10€). a rough black stone ( I had it at home. Take a look around and use things you already have!). I chose this hard and rough stone to obtain a contrast effect with the smoothness of the ring. The plexiglass sheet, used both as shelf and background, will give a nice chiaroscuro effect, very effective in highlighting the picture. The main light must be placed under the subject of the photo, and plexiglass must be lifted in order to host the lamp. If you use a cardboard sheet remember to use also a see-through shelf ( such as a glass frame). After placing the plexiglass or cardboard, bend it on one side to create a gentle corner that will be used as background. Turn on the spotlight under the shelf. You will immediately notice a concentration of the light on the horizontal part, and a grey shade on the vertical part, where the bend was created. All you have to do now is arrange the subject of the picture in place and CLICK! Now, upload the picture on a photo-retouch software, balance the white, adjust contrast and sharpness if needed and…done! 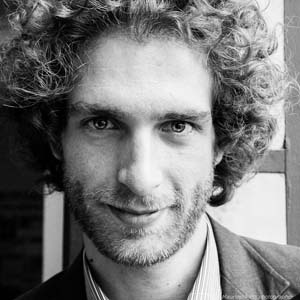 We would like to inform you all that Maurizio Picci, photographer and writer of the guest post, will hold a two day workshop at Source – Self Made Design. The course will be held on Friday September 13th and Saturday 14th from 9.00 a.m. to 5.30 p.m. (full schedule at here ). The cost is only 30€ , reservation needed, since we only have 20 places available. Source – Self Made Design is the first self-made design exhibit, with the consultancy of Make Tank, and will be held in the Villa Strozzi “Limonaia”, in Florence, from September 12th to September 19th. Our workshop “Done! And now, how do I sell it?” will be held on September 13th from 5.30 p.m. to 8.30 p.m. (full schedule here). First exposed to photography at age 18 with his uncle, a professional photographer. At first, just a small work business, mostly printouts and ceremonies, a work soon becoming a passion because photography is a different way to see the world. He prefers “thought” styles such as still-life, architecture and landscaping. Thoughtful moments where a pictures becomes a summary of both subject and landscape. A student at the Faculty of Architecture in Florence, he actively works as freelance photographer for events, design and architecture ateliers and cultural organizations. His blog is: http://mauriziopicci.blogspot.it .